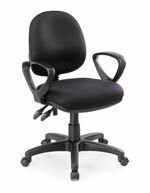 Description The support and comfort provided by the Delta seating range is second to none. Designed in conjunction with a leading ergonomist it combines maximum ergonomic effectiveness with the durability of AFRDI Level 6 certification. Standard features include injection moulded, contoured back and seat, height adjustable gas lift, adjustable back tilt and manually adjustable back height. 3 lever models also feature a fully ergonomic seat tilt option. Special Options Fixed Height Arms, Height Adjustable Arms, Drafting Gaslift and Footring, Inflatable Lumbar Support, Seat Slide, Polished chrome base, Glides, Soft wheel friction castors, Large Seat, Heavy Duty mechanism available on request.